You Can Shoot an Effigy, But What Do You Do With the Man? On January 30, 1948, Nathuram Godse walked up to Mahatma Gandhi at the grounds of Birla House and pumped three bullets into him at point-blank range. The frail old man uttered the name of God, and died. Seventy one years later to the day, in a bizarre re-enactment of the assassination, members of the Hindu Mahasabha in Aligarh shot bullets into an effigy of the Mahatma. They also made sure that fake blood oozed out of their ‘victim’. 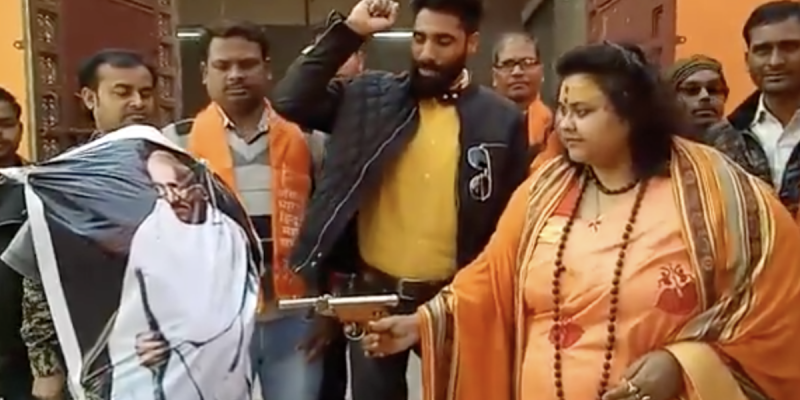 This ghoulish act has received widespread condemnation across the country and criminal cases have been registered against 13 people involved in the event, including Pooja Shakun Pandey, the Mahasabha leader who staged the event. The peace-loving amongst us recoil at this bloodthirsty hatefulness and celebration of violence, and the sane amongst us ask what the point is in shooting a dead man. But perhaps there is another question waiting to be answered, and perhaps it is not as absurd as it might sound: Did they shoot him because somewhere within themselves they know he is still alive? Could it be that those in the Hindu Mahasabha and its many kindred organisations have sensed Gandhi’s spirit walking amongst everyday Indians? Could it be that, despite their best efforts, the voice of the Mahatma and his calm call to compassion and non-violence have managed to waft over the deafening din of hate and communalism, and reach their ears, if not their hearts? And in doing so, has it unnerved them so completely that they feel the need to take their hatred of the man to the next level? Let’s be honest, there is now open sanction for violence against all those considered the enemies of Hindutva. The smouldering dislike for Muslims, for example, that was just about kept in check over the last few decades, has now been openly fanned, and the fires of hatred that have burst forth have taken the lives of many. Does the Hindutva camp brush up against Gandhi’s ghost every time it sees its communal designs fail? The Hindu Mahasabha can shoot bullets into Gandhi’s effigy all they want, but they cannot fight the truth of his words. This is Hindutva’s heyday. Gandhi has officially been co-opted, reduced to a pair of glasses and a broom, so why so much hatred for him? It looks like hate, but could it actually be fear? What an insult to the saffron-colored robe.